**NATIONAL INTERSCHOLASTIC, AIRSHOW AND EXPLORER CHAMPIONSHIPS: JUNE 16-18 HELD AT SALT CREEK. **NATIONAL OPEN AND EXPLORER CHAMPIONSHIPS: JUNE 21-25 HELD AT LOWER TRESTLES. **NSSA NATIONAL CHAMPIONSHIP FINALS: JUNE 25 HELD AT LOWER TRESTLES. TRIVIA QUESTION: Clay Marzo and Eric Geiselman each scored perfect heats at the Nationals. Going back to the record books only three other surfers in NSSA history have earned perfect heats and they were all from Hawaii. Who were they? SALT CREEK AND LOWERS DELIVER: Waves at “The Creek” were a super fun and rippable 2-4 feet on Thursday and Friday. The surf came up for Saturday’s High School and Middle School rounds when the Creek started cranking out solid head high plus sets throughout the day. On to Lowers! Excellent 3-5 foot waves poured through the best break in the nation and if like clockwork, a new south swell delivered perfection rights and lefts for Saturday’s finals. The kids went off! Perfect heats, air 360’s, busting loose tail free gouges, big section floaters, triple-crown wins, record crowds, shattered records, brand new cars, bonus bucks…we witnessed it all. THE MATH: The 2005 NSSA National Championships was an eight day youth surfing showcase marathon. 310 heats were surfed which consisted of nearly 1,000 rippers from the NSSA East, West and Hawaii regions. MIRIAM-WEBSTER DICTIONARY DEFINITION: Clay (noun) 1 a : an earthy material that is plastic when moist but hard when fired. Clay (NSSA member) 2 a: Clay shows the nation how hard he gets when he fires up. THE HAWAIIANS MADE A STATEMENT IN 2005. THEY RULED IT! HAWAIIAN “DOM” PATROL: Out of the six Open and ten Explorer categories at the National Championships, Hawaii surfers took control. Dominating four of the six Open categories and six of the ten Explorers, the Hawaiians establishing themselves as the ruling class for 2005. 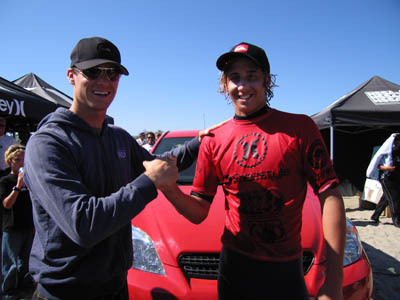 CLAY MARZO STEALS THE SHOW: Fifteen year old Maui local Clay Marzo not only claimed the biggest prize in youth surfing – the National Open Mens/Governor’s Cup crown – he hit the jackpot with two perfect 10’s, a Toyota Matrix, mega Body Glove bucks and multiple Freestyle watches. Not since Kalani Robb’s Open Men’s victory in 1993, has a fifteen year old claimed the Open Men’s gold. But Clay was in control from his opening perfect 10.0 ride, and then another one five minutes later to close the heat off with a perfect 20 and another throwaway wave of 9.5. His competitive performance peaked at the perfect time as he stepped up the intensity and took everyone to school. Clay lived up to the big expectations coming off of his two Nationals victories in 2004 in the Open Juniors and Explorer Boys. We thought his mindblowing display in 2004 was incredible until this year. No one in NSSA history has surfed a perfect heat in a Nationals final - no less the Open Men's! We can only imagine what Clay will bring to the table in 2006! JEFF HURLEY CONGRATULATES CLAY ON HIS AMAZING PERFORMANCE AND NEW WHEELS. CLAY'S AFTER NATIONALS MISSION: Usually the car comes after the license. Not this time. Clay is going to have to wait until July 17 (his 16th birthday) to cruise solo in his new vehicle. RECORD BOOKS: Three 15 year old (Open Junior) surfers have now won Open Men’s titles. Chris Frohoff in 1981, Kalani Robb in 1993 and Clay Marzo in 2005. Three surfers have won Triple Crown titles (titles in the National Interscholastics, Explorer and Open). Nea Post in 1990, Carissa Moore in 2004 and Carissa Moore in 2005. CARISSA COMMANDS THE WOMENS…AGAIN! : On Explorer Women’s preliminary day Friday, June 17th at The Creek, 12 year old Carissa Moore was ripping hard and seemed to be living up to the massive expectations until the unexpected happened. She couldn’t get into the groove in her semi and was bumped out of the competition. But that was OK for the pre-teen from Honolulu, because she still had three more title chances plus a crack at another NSSA Triple Crown. Carissa came back on Saturday and put on a stunning performance which included vertical lip bashes, flashy tail slides and 360 reverses easily defending her Middle School Girls title. The comments heard all over the beach, “This gal really does surf like a guy.” On to her kingdom at Lowers. She kicked off her quest in the Explorer Girls division winning every heat. In the Open Women's/Governor’s Cup final, she cranked it up a notch. She opened the heat with a 6.75, which wasn't too shabby but that was only a hint of things to come. Three waves later, she blazed it up on a crisp right hander with scores coming in at 8.5. Two waves after that we witnessed her best ride of the day…straight up lip bashes, smooth roundhouse cutbacks, a sick reverse and a couple more vert lippers which all added up to a near flawless 9.5 score. Carissa claimed her second consecutive Open Women's/Governor's Cup victory and another Triple Crown triumph in the books. 2005 NATIONAL OPEN CHAMPIONS: Kai Barger ripped his way to the Open Juniors victory and his third National title (Kai took the Explorer Menehuene title in 2001 and Open Boys in 2002). He also took 3rd in the Explorer Juniors final and made the quarters in the Open Men’s. Da Boys: The best 12 year olds (and younger) in the nation squared off and John John Florence proved why he is already a decorated mini superstar. He collected his third and fourth National titles winning both the Open Boys and Explorer Menehuene divisions. Speaking of mini, Mini Grom Kolohe “Brother” Andino put on a surfing display well beyond his years with full wrap around figure eights, solid lip bashes, mini airs and big floaters. Brother nailed a perfect 10.0 score earlier in the week and numerous 8’s and 9’s. He claimed his first National title in the Mini Grom division and also finished runner up in the Open Boys and 3rd in Explorer Menehuenes. His dad Dino Andino is a former Open Men’s champion so looking in the crystal ball we may see the first ever Father/Son title combo. In Longboard competition, it was the battle of the Christians with Christian Clark edging out West Coast Champion Christian Wach by a nailbiting 0.75 margin. Wach had the high scoring wave of the heat with an 8.75 over Clark's 8.50 score but Clark's second wave came in higher earning him his first National crown. HIGH SCORING HEAT TOTALS: Well that’s an easy one. How about not one, but two perfect heats? To open up day one of the National Championships at Lowers, Florida’s Eric Geiselman went straight to work and lit up on not one but two perfect Lowers beauties. The first perfect score got massive cheers from the crowd but when the announcer called 10’s across the board on EG’s second wave, the beach went crazy. The bar was officially raised but that would only be the beginning. On Lowers’ day five, the final day of the 2005 National Championships, Clay Marzo took National Championship surfing to another level. Clay stroked into his first wave of the final - a head high left hander. Off his first bottom turn, Clay launched into a frontside full speed carve air 360 and landed it and continued on the wave with huge tail free snaps in the pocket. Then a couple waves later, he caught another Lowers nugget and did his thing again! Huge tail releasing gouges and another air 360 to finish off the wave and Clay fires up a huge reputation while earning a place for himself in the record books. NATIONALS AIRSHOW: Besides the Open Men’s final, the most crowd pleasin’ heat seemed to be the National Airshow final. East Coaster Marshall Alberga launched seven airs much to the delight of the hundreds of spectators but when Kilian Garland busted out a double grab rotation, the entire beach let out a roar so loud you could hear it echo all the way to Churches. This makes five National titles for Kilian to close out his amateur career. Not to shabby for the lanky lord from Central Cal. CARS, BUCKS AND WATCHES: Clay Marzo cleaned house with a brand spankin’ new bright red (to match his jersey), Toyota Matrix compliments of Hurley International. 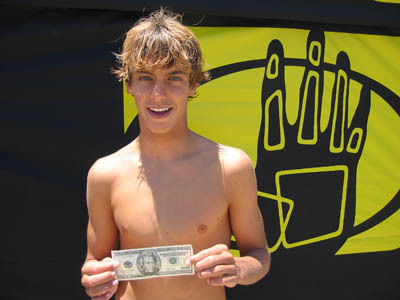 He also collected five Body Glove bonus bucks for high wave scores (100 bones total) and a load of Freestyle watches. Twenty-seven kids shredded their way to 9’s or better and Body Glove rewarded their top notch surfing performances with 20 dollar bills. Freestyle backed that up with killer watches to anyone with a 9.0 or better. BETHANY DOES IT! : Dismiss all the hype, brush aside the shark, forget about using only one arm. Fifteen year old Bethany Hamilton absolutely annihilated the Explorer Women’s final, shredding Lowers lefts to pieces. Accepting her National title at the Banquet to a 500 person standing ovation, Bethany thanked God and her coach Ben Aipa for helping her on her title mission. After her third place showing in the Open Women's division (before the attack) in 2003, we knew it was only a matter of time until this special girl achieved Nationals gold. TRIVIA ANSWER: Kalani Robb, Eric Diaz and Andy Irons. KILLER TV COVERAGE: The 2005 NSSA Nationals has been taped for a half hour television special to be aired later this summer at a time and network to be determined. As soon as this has been confirmed everyone will be notified on our website. The NSSA greatly appreciates Oakley and their assistance in being able to make our television show a reality. NATIONAL INTERSCHOLASTIC CHAMPIONSHIPS: Nothing new in High School competition. The force still runs deep as San Clemente won their seventh career National title and sixth title in seven years. Dane Ward and Colleen Mehlberg claimed the High School Men’s and Women’s crowns respectively for San Clemente. SC Coach Bill Hartman graciously received the Nationals’ trophy while also accepted his third “Coach of the Year” award from the NSSA. In Collegiate competition, UC Santa Barbara came off their third place showing in 2004 and laid claim to their 10th National title – the most of any college team. The Gauchos rich collegiate history and school support always seems to vault them to the top despite the lack of superstar team members. There’s “no I in team” when it comes to the UCSB squad. In the Middle School Championships, Bernice Ayer defeated defending champion Dwyer in a close battle up until the finals. Strong special team showings by Bernice Ayer made the difference. THE BANQUET: Over 500 people attended the NSSA Awards Banquet…the biggest crowd ever. A great time was had by all and an awesome vibe filled the room as we saluted our champions for 2005. ** The NSSA National Championships is the fifth of five major championships presented during the 2005 NSSA competition season. *The NSSA National Championships June16-18 Salt Creek and June 21-25 Lower Trestles (COMPLETED). For all inquiries regarding the 2005 NSSA National Championships, please email NSSA Executive Director Janice Aragon at [email protected].